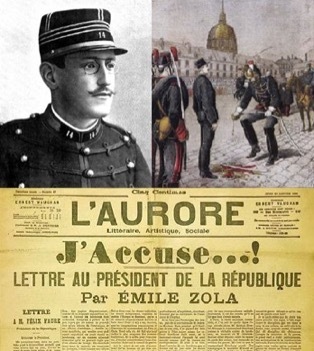 The story is that of the infamous Dreyfus Affair of the 1890s researched from contemporary sources.In 1895, Captain Alfred Dreyfus, a Jewish Officer in the French Army, was wrongly found Guilty of Treason and sentenced to Military Degradation and Life Imprisonment on Devil's Island a former leper colony off the North-East coast of South America. At his Court-Martial a secret dossier was illegally shown to the judges, but not to the defence. Thus began the Dreyfus Affair, which caused anti-Semitic riots on the streets of France, condemnation of the French Government throughout the world, and, by its influence on Theodore Herzl, led to the development of Zionism. To save the honour of their Army and its Minister of War, the General Staff consistently lied, and created forgeries in order to keep Dreyfus a life-long prisoner on Devil's Island although they knew him to be innocent. In 1898, Émile Zola wrote his famous open letter to President Faure, J'ACCUSE...! Dreyfus was exonerated in 1906. The French army officially declared Dreyfus to be innocent in 1995 ! Among the amazing characters who were involved in these events, figures Alphonse Bertillon, the inventor of Anthropometry - a very complicated system of measurements, used (with great inaccuracy) for identifying criminals before fingerprinting came into use. He was called as a handwriting expert (which he was not) at both of Dreyfus's court-martials, where he was described as having used, "absurd and entangled arguments with outrageous vocabulary like a necromancer's spells." The Dreyfus Affair leaves us with a sobering message on the subject of human rights, which is as relevant today as it was over 100 years ago.